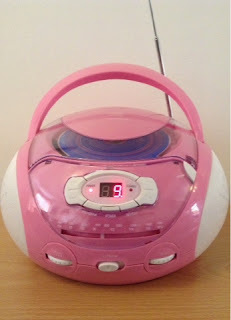 Life with Liv: Asda pink boom box review. Liv was very lucky recently to be sent a lovely pink boom box to review from Asda. Surprisingly (or not!) she is a huge Frozen fan so we decided to get her the Frozen CD to use with her new CD player, and we have all been singing it since. To say she was excited the first time we used it would be a huge understatement! She didn't even know what it was when I took it out of the box but she immediately started to squeal and jump up and down excitedly just at the sight of it. It honestly couldn't have been easier to set up. I simply took the boom box and power cable out of the box, slotted the power cable into the back, plugged it in switched it on and we were away to go! The unit has a digital screen to show the track number, a play/pause button, a skip back and skip forward button as well as a stop and power off/on button. Other than that all there is is a AM/FM switch, radio tuner and volume control and the CD is entered/removed by simply pressing the open button, lovely and simple for little ones to learn to use. Of course being a boom box it comes with a handle and the option of battery use for travelling - requires 6 C batteries. The sound quality is very good to my untrained ear, Liv adores the colour, it is nice and compact and an excellent price - just £20! - so we are pleased all round. There is also the option to use headphones which I'm sure will come in handy as she gets older. If this isn't to your taste Asda do a selection of other CD players too. Disclaimer - I was sent the item for the purpose of the review, however all opinion is my own.